ZSFM Deluge Valves, Fire Protection consists of main valve, hydraulic warning-well, pressure switch, manual ball valve, solenoid valve, three-way ball valve, needle valve and control pipeline, and equipped with the opened shower, water curtain shower, closed shower and fire warning control system, can form the corresponding water sprayed fog fire extinguishing system. It features by the simple structure, easy, safe and reliable operation, convenient installation and maintenance. In case of a fire, the valve is opened together with the opened shower to spray water automatically to extinguish it, tuning off the fire source quickly but also spraying water automatically onto the whole area protected so as to prevent the fire from extending. It is suitable for the buildings and playground easy to fire or requiring to be protected seriously or having a big fire danger. The main valve of ZSFM series diaphragm Deluge valve divides itself into upper and lower two cavities, the upper one is the control cavity, which utilizes the pressure difference produced by the two cavities to realize sealing of it. When there is no fire, the ball valves handle is downwards, and the needle valve, overhaul ball valve and final-end ball valve are opened, the solenoid valve, manual ball valve and drainage ball valve are closed, the pressure gauge 1 shows the inlet pressure and the pressure gauge 2 shows zero. The main valve is closed then. There are three control modes, in case of a fire, to control the main valve open to put out the fire. After the main valve is opened, pressure steps into both pressure switch and hydraulic warning-bell, the latter sends out a warning sound and the former sends out a signal to the control center or to open the fire-fighting pump. 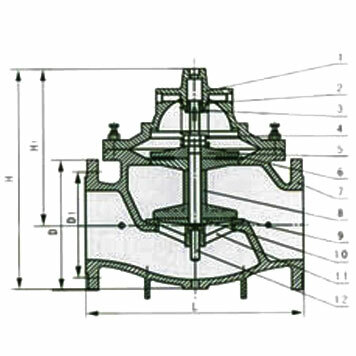 This valve is of the reset resisting structure, which opens automatically after the main valve is opened by 10% to prevent it from reset due to wrong operation. 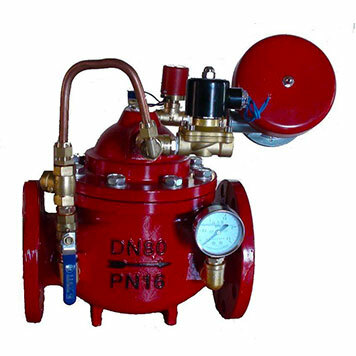 After the fire is put out, the main valve can be closed just by cutting off the driving pipeline, closing the solenoid valve, manual ball valve and final-end valve.